Our family loves my husband’s grilled salmon. 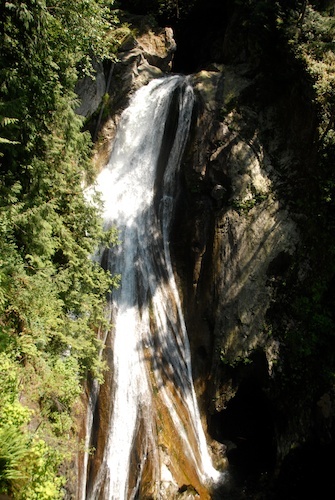 He grilled the salmon above on a cast-iron griddle on the stove, eye-balling the doneness. Eye-balling hasn’t worked for me, though, and a beautiful, expensive fish that’s been cooked tough and dry is a sad thing. So I’ve been happy to learn a consistently successful pan-frying method from Becky Selengut’s new, expanded edition of The Good Fish Book. Like me, Selengut gauges sustainability using the Monterey Bay Aquarium’s Seafood Watch and favors Alaskan seafood. When Alaska became a state it was written into the state constitution that the catch be sustainably managed. Selengut’s directions for pan-searing salmon are similar to what my husband and I learned from another local cookbook, Cook + Cork, as the ‘restaurant method’ of grilling fish. You pat the fish very dry with a paper towel, salt it, and grill it at a high temperature. Her other tip is to use a meat thermometer to check the temperature of the fish as it’s cooking. A 120 degree internal temperature yields a consistent medium-rare fish. It’s working much better than eye-balling for me. The high heat of searing or grilling could make carcinogens in the meat, so it would probably be better to cook it on a slightly lower flame. But the higher the heat, the crispier the skin, so it’s a trade-off. 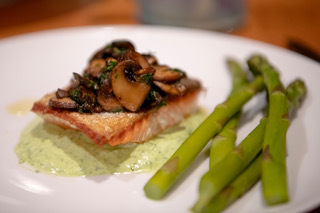 I liked Selengut’s idea of serving salmon over a yogurt-based green goddess sauce. She has a recipe for salmon with morels, peas, and green goddess sauce that would be great for a spring feast. Her green goddess sauce is complex and I’m sure amazing, but I’d only make it for a special occasion (it requires fresh dill, parsley, mint, tarragon, chives, and basil, as well as an anchovy and other things). For everyday cooking I made a simple green sauce with nonfat Greek yogurt, fresh parsley and dill. I’ve used green onions instead of dill and that was excellent too. Fresh basil would also be good. Each time I used lemon juice and I wouldn’t change that, I like the brightness the lemon gives. For her full collection of salmon recipes and many more definitely get the book. You’ll enjoy her focus on sustainability and technique and it’s a pretty book with gorgeous layout and photos. I’m looking forward to dipping into it again soon. ¾ cup fresh green herbs. I used ½ cup Italian parsley and ¼ cup dill, neither chopped very much or packed but measured out still in chunks. Combine Greek yogurt, olive oil, fresh herbs, lemon juice, salt and pepper in a blender and blend until smooth or mostly smooth. Stir-fry the mushrooms in olive oil. Add vegetable stock and dill. Cook a few minutes longer until most of the stock is cooks down and is absorbed. Cut the salmon fillet into four portions. Dry each portion carefully with a paper towel. Salt each portion. Heat the olive oil in a cast-iron pan until quite hot but not smoking. Add as many pieces of salmon as will fit (two, in my case). Cook skin side down for 3-4 minutes. Check the skin by pulling up a corner of the salmon with a spatula. If it is quite firm it has cooked enough, turn the fish. Insert a meat thermometer into the fillet. Watch the thermometer until it reaches 120 F. In theory this should be in 1-3 minutes, but it took a little longer for me (I had the flame a little lower-- perhaps not as good culinarily but maybe a bit healthier). Once the internal temperature of the fish has reached 120 F, remove the fish from the pan. On each plate place a blob of the green goddess sauce. Place a portion of fish atop the sauce. 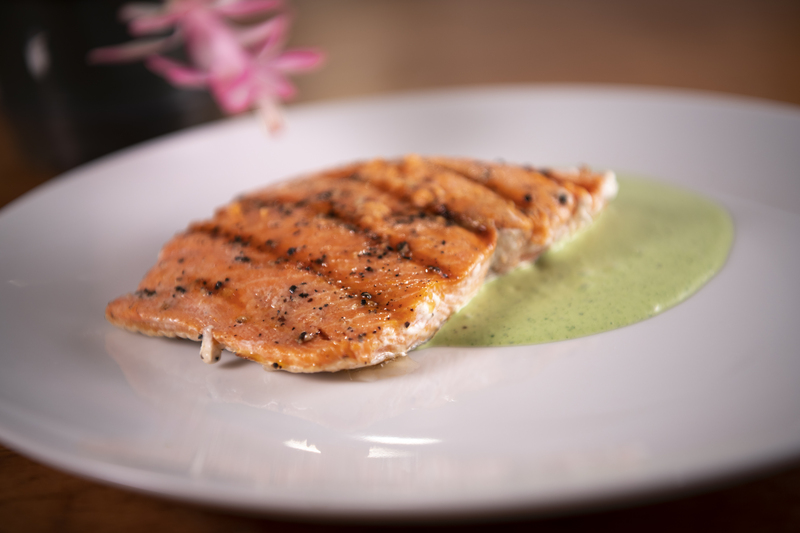 Northwest Grilled Salmon Copper River sockeye salmon marinated in a garlic, ginger, gluten-free tamari and rum or bourbon marinade. 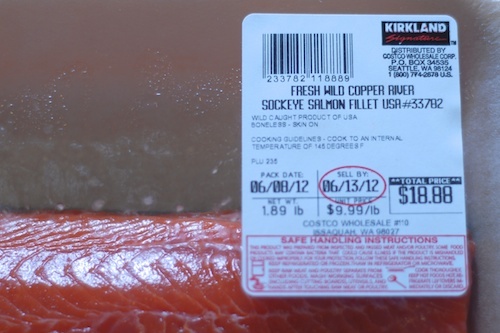 Instructions for grilling and how to tell if your salmon is perfectly done. Baked Steelhead An easy recipe for baked steelhead trout. Pan-fried Dover Sole I expanded my fish cooking skills by pan-frying Dover sole with Dijon mustard and lemon or Key lime juice. King Salmon with Red Quinoa and Peach Cherry Compote A summer salmon entree with wild king salmon, a grilled fruit compote with cherries and peaches, and red quinoa. Mmmmmm….love salmon–and this recipe looks easy as well as delicious! YUMMM!!! I am on a huge salmon kick right now. Glad you are finding some good salmon even while you are out of the Northwest!